When I lived in a tiny, but undeniably lovely apartment in Montreal, I spent most of my time around the kitchen table baking, eating, or working. 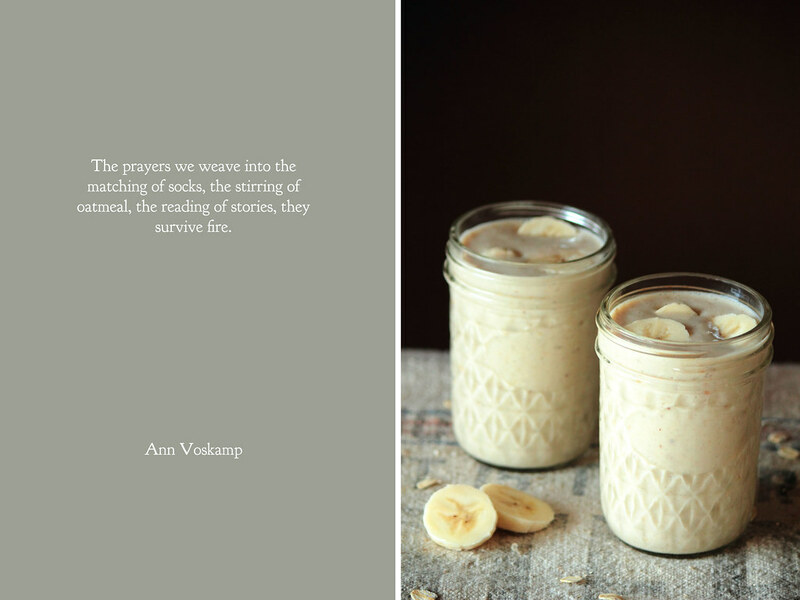 I spent my mornings and evenings in the kitchen, discovering a passion for food in the sugar jar and the heat of the oven. The kitchen was minuscule, incapable of even holding a refrigerator, but the dark, wooden table and the large open windows made the space feel like a home. I wasn't the only one who had the same feelings. A small mouse moved in, making a nest in a hole behind the stove. My roommate was the first to spot the visitor, as he scampered into hiding once his secret had been found out. As we wondered what to do with our little friend (mousetraps were certainly out of the question unless they were humane), my roommate went away for a weekend and my mother came to visit. My roommate and I thought it best that my mother didn't know of our little friend. Firstly, so she wouldn't believe we were living in squalor and, secondly, so that she wouldn't fear sleeping on the futon which rested only a few feet from the mouse's house. Since it had been nearly a week since the mouse's discovery and he hadn't appeared for me, it seemed best to keep mum on the subject. On the second night of my mother's visit, we sat around the kitchen table enjoying spaghetti squash and fresh figs. In the quiet of the apartment, there was suddenly a tiny scratching sound coming from the inside of one of the cupboard doors. The mouse, it seemed, wanted to say hello. As my mother stared at the cupboard in horror, imagining a range of creatures hiding behind the door, I spilled the secret, backed into a corner by none other than the mouse himself. Though my mother raised her eyebrows at my explanation why the mouse had become my third roommate, she kept her thoughts on the subject to herself. My mother, to her credit, still slept on the futon. It was a few days more until I spotted the mouse for myself. As I quietly worked in the living room, he finally peeked out to look me over. He was so tiny I could have easily held him in one hand, sporting ears as large as elephant's. I couldn't help but fall hopelessly in love. I began to have childish fantasies of transforming the movie Ratatouille into a reality, turning the mouse into a pet with an appreciation for good food. Then the reality of having a mouse in the house hit me. The mouse, though tiny as he was, had an uncanny ability to peep about in the baking cupboard. He ignored the baking staples as he looked for his prize—a large bag of almonds. Overnight two pounds of almonds disappeared. Though I was upset about that (almonds certainly aren't cheap), it was the thousands of little crumbs he left behind for me to clean up that drove me to frustration. I cleaned out the cupboard, moving sealed baking supplies and tossing out the rest. When we discovered the corner he treated as a litter box, my desire to have a mouse friend began fading. The mouse, to his credit, was a very quiet house guest, leaving a long enough time between his little surprises that we'd forget we even had a third roommate. I moved away before the saga of the mouse had come to a head. Sometimes I wonder about that little mouse and his whereabouts, curious how long it took him to eat his almonds. Sometimes I worry that my own kitchen will capture the attention of a little mouse, especially when the dishes begin to pile on the counter top. Perhaps it wouldn't be so bad if it did—he could help me pick up the crumbs from off the floor. 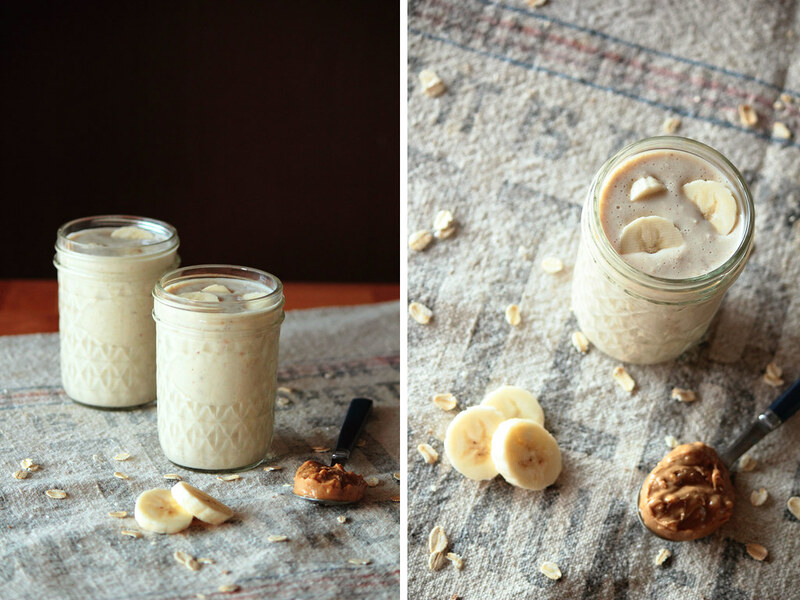 This Banana Peanut Butter Protein Smoothie is sweet (without added sugar) and absolutely filling. 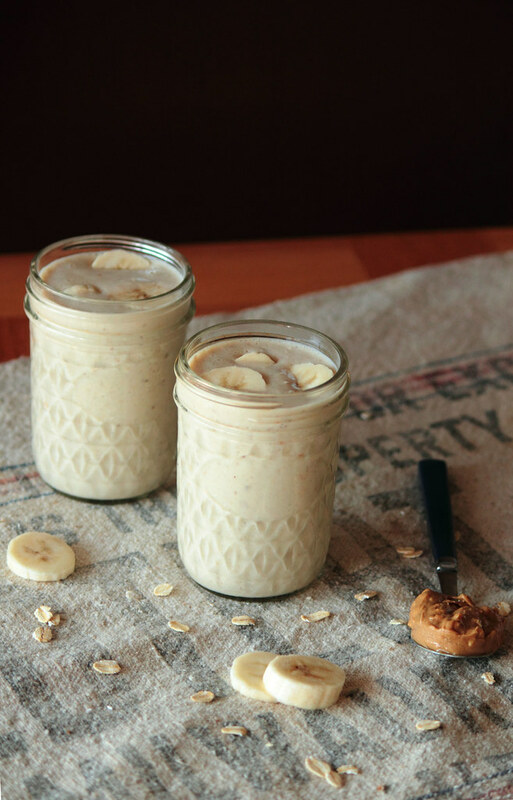 Bananas, peanut butter, tofu, and oats come together to create a robust, flavorful beverage. 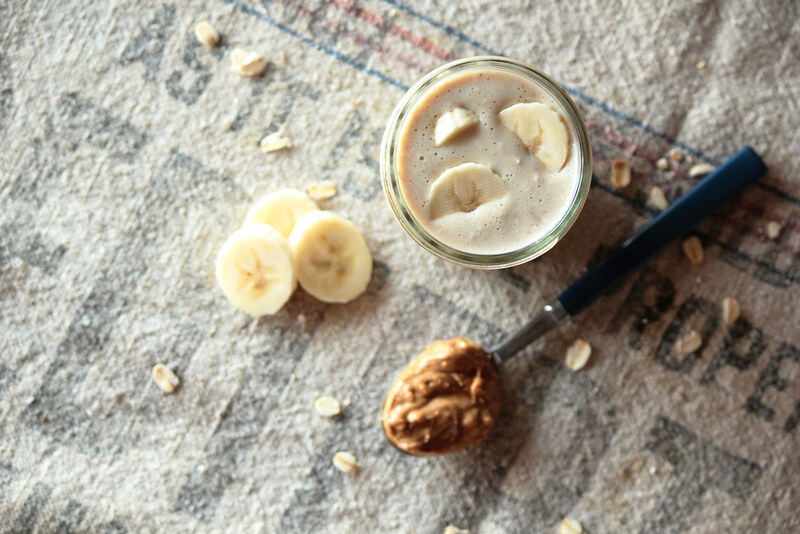 One serving of the smoothie has roughly twenty grams of protein, making it a good choice when you need to power up. If you are nervous at seeing the word "tofu," don't be worried; like yogurt, it thickens the smoothie but lends no flavor to the final product (just protein! ).